Why did you become a Peer Mentor? 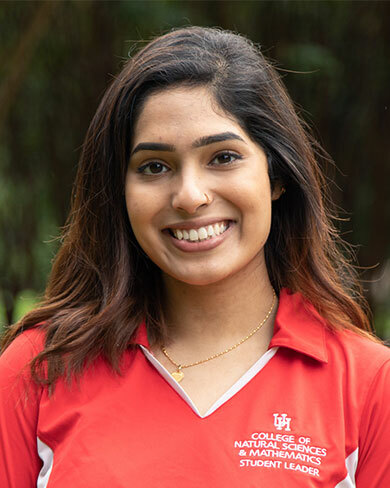 I became a peer mentor to share the good lessons of my college journey with other students so that it may help them navigate their own journey as a student. Being able to rebound from a difficult time in my early college career, I can attest to two things: (1) Nothing good ever came out of the comfort zone and (2) success is not a matter of if, but when. A bit unorthodox, but instead of eating to de-stress, I cook. I get my friends together for a small dinner party, and I cook for them. By serving them an amazing meal, they give me tremendous feedback and affirmation, and that usually resets me stress-wise. They call me the "Protein King." What have you done in college that you never thought you could do in high school? I never thought I'd be an outdoorsy guy like AT ALL. I have gone to most state parks in Texas and several national parks around the country. College has really allowed me to meet some inspiring and fearless people who have taught me to live outside of my comfort zone. 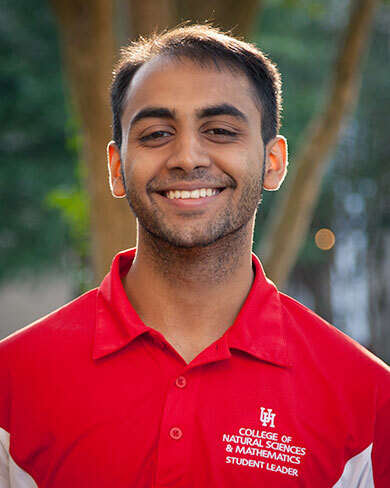 I became a Peer Mentor because I want to help incoming freshmen feel welcomed in NSM. There is so much they can do while in college, and I want to be the person who helps them remember why they are here to begin with. I de-stress by surrounding myself with people that I love. Nothing says happiness like spending some time talking to family! If you could tell your freshman self one thing, what would it be? If I could tell my freshman self one thing, it would be to not let my fears hold me back. Get out there and meet new people. Don't be afraid of uncomfortable or unfamiliar situations! I became a Peer Mentor so I could help make college just a bit easier for freshmen. 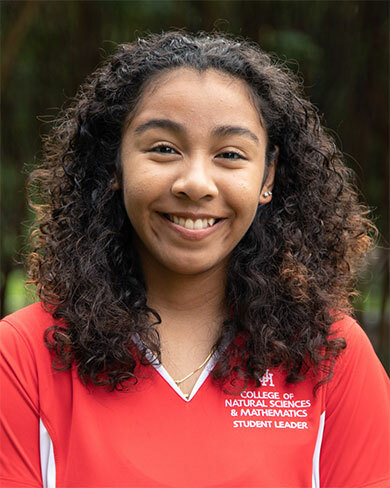 Starting college is sometimes harder for some, and I want to make sure that all of the NSM freshmen have whatever they need to adjust successfully. I listen to music! It might be kind of a lame answer, but it's kind of cathartic to organize playlists and discover new music. I mostly listen to Hip-Hop, Indie, EDM, and Kanye, but I'm open to all genres! What do you love about Houston/UH? The culture and the food. I consider myself lucky that I live in a city where I can partake liberally in not only my own culture, but others' as well. As a bonus, I get to try a ton of new food as well! 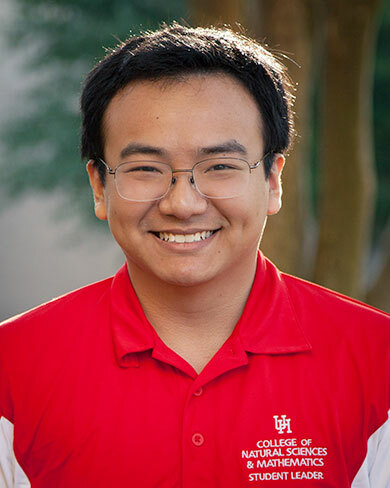 When I applied to universities, the only university that accepted me was the University of Houston. 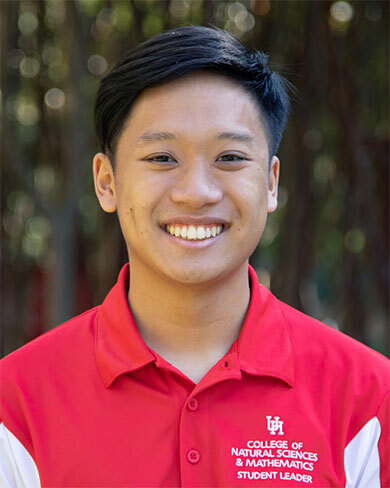 I briefly considered going to UH for a short time before transferring to another University. I quickly decided against that after I fell in love with UH. 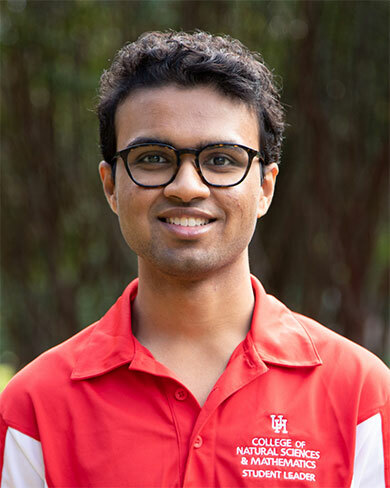 I love UH because it's a quickly growing school with a diverse student population. 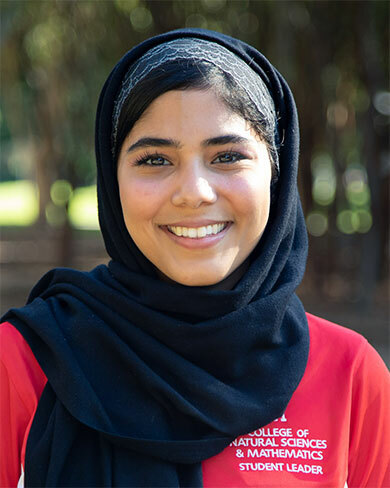 The diversity of the student body is important to me because I become exposed to other beautiful cultures, and I'm surrounded by viewpoints and backgrounds that help me constantly reshape my outlook on life. In high school, I had no experience with tutoring. I never attended tutoring myself even though I desperately needed it. However, in college, I got involved in tutoring and facilitating workshops for many math and science courses. This revelation led me to understand that teaching was one of my favorite things to do. I was helping students gain knowledge required to become successful, while getting a comprehensive understanding of subjects that I like to teach. Coming into UH, I had been the most average high school student to ever exist. I wasn't expecting to really enjoy college. I knew that I was just there to get my diploma and get out. But as I got more familiar with the college and the subject material taught in my classes, I realized that I could have a great time in college while still focusing on my studies. However, I had many fellow classmates and friends who ended up following the path that I initially thought I would follow. 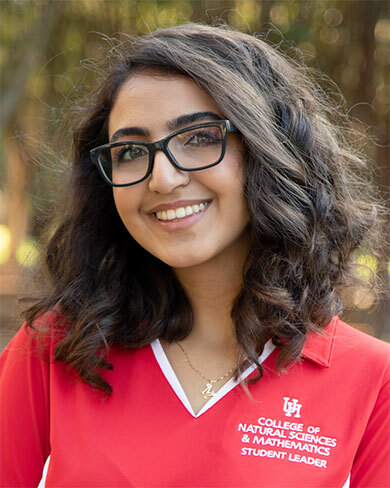 The reason I became a Peer Mentor is because I want to show that regardless of your background, UH and the College of NSM have the students, faculties, organizations, and resources to make college a truly rewarding time of social growth and learning as opposed to a university where you are a number in a system seeking a degree. My freshman year was a huge struggle for me. Between transiting from high school to college and moving countries to start college in the United States, I found myself sinking. I ended up making several friends who were upperclassmen who helped me a lot throughout it all. They acted like unofficial mentors and were there for me as both friends and academic advisors. I ended up doing better because of them and was inspired by them to do the same for others, which is why I became a Peer Mentor! Breathe! Take each day one step at a time. Don't be so hard on yourself. Nobody has their life figured out right now, even if it may seem like they do. Work hard, and most importantly, work with integrity. Join student organizations on campus; a sense of community is so important for your success. Have faith in yourself; you've come so far, and you will do great things. Be patient, things take time. Learn to involve yourself in projects that don't give you immediate gratification. Most importantly, have fun. You're never going to be this young again. Make friends everywhere you go, and make the most out of your freshman year! 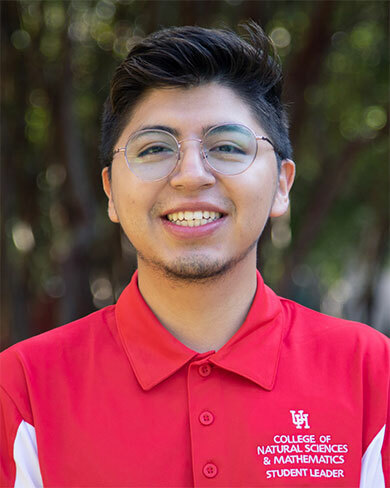 Something that you won't realize until you interact with people from other schools is how much pride Coogs have; and that's probably my favorite thing about the University of Houston. We take so much pride in our school, and we're always aspiring for improvement. More importantly, we have a huge sense of community. 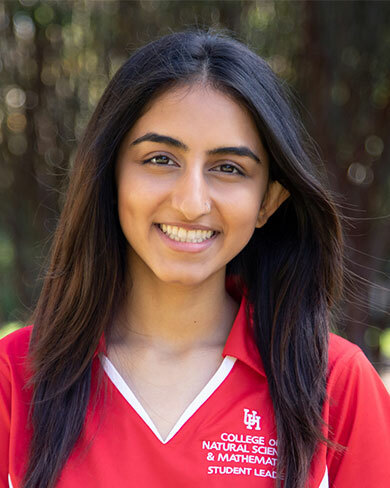 When Hurricane Harvey struck, Coogs were some of the first people to go out into the community to help people recover from the devastation that the hurricane caused. It's amazing to know that through thick and thin, we as Coogs and as Houstonians always stick together. Transitioning from high school to college was hard for me. I didn't know anyone that I could get advice from because I will be the first in my family to get a bachelor's degree. Because of this, I was pretty lost my first year and didn't get to experience as much as I wanted. This is why I became a mentor. I want to help students enjoy their first year, not regret it. Honestly...I stress eat. This is very unhealthy so to those reading this, don't do this! I also listen to music to de-stress because I feel like music is a great way to just relax and forget about all your problems for awhile. But besides food and music, my ultimate secret to de-stressing is my mom. I just pour out all of my feelings, problems, and even tears to her! I would tell my freshman self to choose my own life. I spent my high school years trying to live up to other people's expectations and dreams, and in the process, lost track of what I wanted. This resulted in a rough start of college. So to my freshman self, do what you love! What been your favorite college experience? My favorite college experience is when I got a 3.8 GPA for a semester! It highlighted my ability to put in work and the rewards it yields. To de-stress I go to comedy clubs. Being in an environment surrounded by positivity, smiles, and laughter is psychologically proven to increase your serotonin levels! 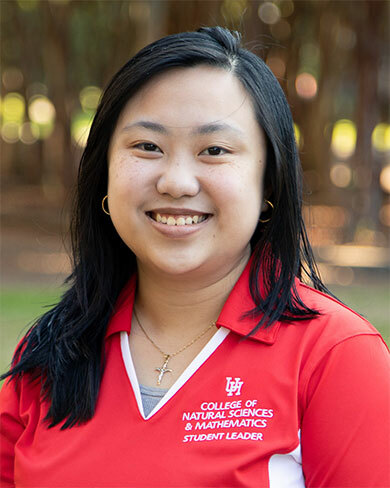 Why/how did you choose your major? I chose a major in biology because it was a subject that truly interested me. To be a great biologist, you need to integrate chemistry and physics. To me being a biologist was a career where I could test the limits of my mind by integrating multiple fields of science. 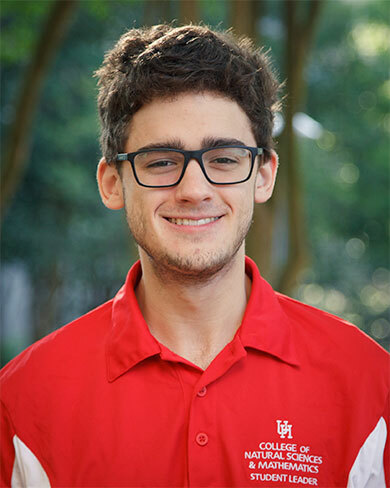 I love the environment and atmosphere at UH. You always feel welcomed and at home. No matter what part of the world you come from there will always be people you can relate to. Get involved on campus. As a freshman, my number one focus was academics, and I really didn't make time for getting involved on campus. It would have definitely helped with meeting new people and easing the transition from high school. When I was a freshman, I wish I had known upperclassmen who had gone through the same courses and experiences as me who could help me out and give me tips. 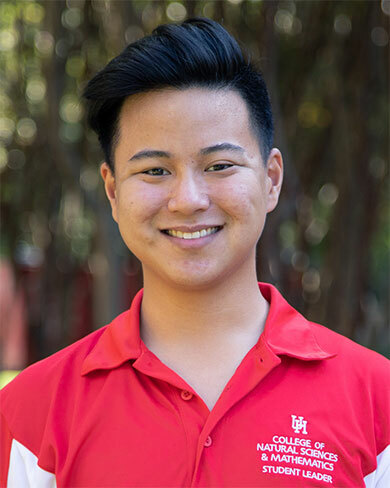 Freshman year would have been a lot smoother if I did, so I decided I want to be there for freshmen and help ease the process of starting college at UH. 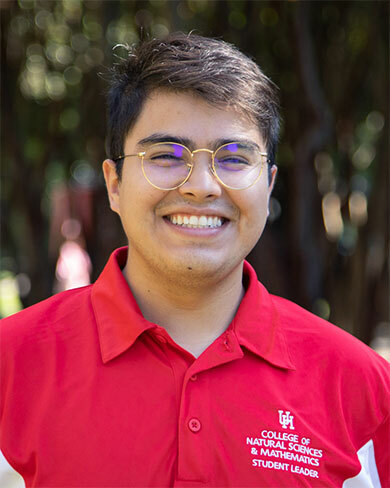 I became a Peer Mentor because I know the transition into college can be a little scary, and I think it would be awesome to help make it easier for incoming students! College is an exciting yet intimidating experience since everything is so new. My freshman year would have been less stressful if I had someone to guide me in the direction that I knew I wanted to go into. So, hopefully I can be that person for new students. I would probably tell her to be more open. I was extremely shy and timid and didn't really participate in any extracurricular activities or social outings. I really wish I would have done more than just go to class and back to my dorm because there are actually a lot of opportunities to network and have fun! Number one on my list of ways to de-stress is probably working out at the rec. It's nice to break a sweat and channel my focus on breathing rather than solving homework problems. I also like to watch movies and go out with my friends after I finish studying for a big exam because it's important to treat yourself after working so hard! As a transfer student, I wish I had someone close to talk to about the best place to study, where to park, and things of such nature. I want to make sure incoming freshmen are better accommodated to college life than I was. 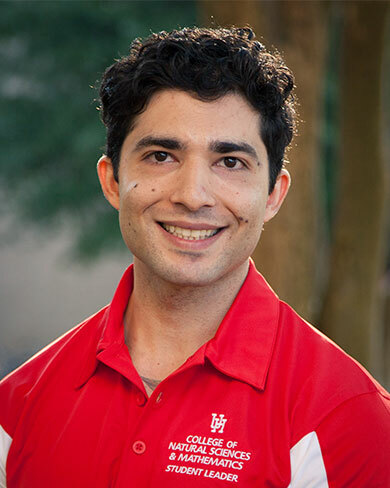 Being that I am also a Dreamer, I hope I can reach out to those and others of the opportunities UH offers. All in all, I want to be a friend who you can reach out to and know I’m willing to spill the tea. Don’t just go to class and race straight home! Stay after and explore the campus, go to events, join a club/organization, and make some friends, expand your connections. Also, don’t let your social life overrule your studies, try and divide up your upper-level classes with your core, that way you don’t become overwhelmed if you have to take classes over the summer. Most importantly, don’t forget to sleep, self-love is important, and yes take naps, sure. I like to surround myself with music either at my dorm, a live concert or as I drive. I will at times just go outside for a walk with my music. Sometimes, I’ll make some tea or coffee or treat myself out for some boba. I’ll take a nap; I don’t know if that counts as doing something, but sometimes you have to stop what you’re doing, breathe, and stare into space doing nothing, which is something, right? What is your favorite tradition at UH? My favorite UH tradition is Frontier Fiesta. It’s a great time to catch up with your friends while listening to music, enjoying free food, riding the amusement rides and even roller skating! Ten years from now, I see myself working as a dentist in the suburbs of either Dallas or Houston. I’ve always been interested in the culinary arts, so perhaps I’ll be a dentist by day, and my family’s private chef by night. I’ll also have at least one dog of my own by then, maybe two. My favorite thing to do to de-stress is to treat myself to some good food! After a long week of multiple exams, I go onto one of my favorite apps, Yelp, and search up new places to eat around the city. Studying for long periods of time at the library or in your room contributes to a feeling of cabin fever, so getting off campus for a few hours here and there is really refreshing. I also like to catch up on my favorite Netflix shows or any novels I may be reading. During my junior year of high school, I took AP Physics. The teacher for that class was the best instructor I’ve ever had simply due to the amount of effort and passion he put into teaching the subject. He was able to engage me in a way that caused me to fall in love with the subject. By the time I had to select a major for college applications, I had no doubt what to choose. I have had the opportunity to spend a summer to travel to another continent and study Physics. In addition to being an academic experience, I was able to travel internationally for the first time in my life. 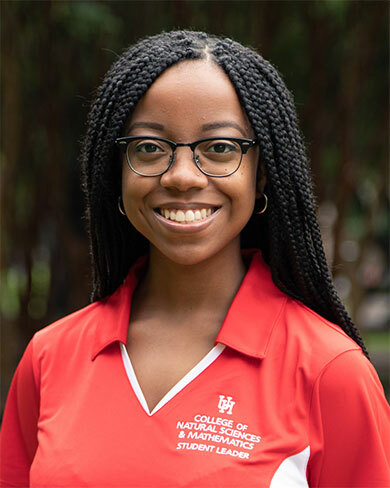 Overall, the trip provided invaluable exposure which will help determine what I will do and where I will go after completing my bachelor’s degree. I love the food. From fast food to the fanciest of restaurants, there is an immense variety of different types of food. I have never been anywhere else that has such a wide range of good quality food choices. I have been a science tutor for almost every undergraduate course. But, I wanted to contribute more to my college. I wanted to help the students not just with their academic life, but also with how to create and join strong social networks on campus, participate in campus activities and lead a well-balanced life. The peer mentorship program is a program I truly believe in. I love working out and reading. I read all sorts of books, but my favorite is fiction. Honestly, if I am not working, I am either running, cycling or reading a book. Love the diversity, hate the traffic! My high school Biology teacher told me about the different careers paths for a Biochemistry degree. I was interested in pharmacy at the time, so I thought this was an excellent major for the field. During freshman year, I had my doubts about this major because I felt it had nothing special. However, after taking my first Biochemistry class and exploring research opportunities, I knew I wanted to stay in this major. It is one of the most rewarding things to learn how the smallest enzyme or protein functions to facilitate my daily activities. It depends on the kind of stress, but I have two methods that work for me. One is that I go and do something that does not require a lot of thinking such as cleaning up my desk or organizing. As things become more clean and organized, I feel accomplished enough to compensate for the things I am stressing about. Second, I also go to a coffee shop, like Cougar Grounds or Starbucks, that offers a place to drink and talk with my friends. Talking about my stress or joking around with my friends after class is a nice break in my day. College is not as easy as going to class and getting As. If college was a second high school, then it would be simple and fast. Employers and graduate schools look for someone who has experience and knows how to work under pressure. Having the ability to balance between school, work, and clubs as an undergraduate is the most important factor in "passing" college. I have heard of 4.0 GPA students who focused on academics and disregarded extracurricular activities and ended up in a worse position than those who have a broad college experience. What has been your favorite college experience? My favorite college experience has been studying abroad for a winter in Mexico. This was the first time I traveled out of the country on my own, and I was both excited and terrified at the same time. The experience not only enriched my understanding for the culture, traditions and language there, but I was also able to understand how it felt to live in another country and be a part of their everyday life. If I could tell my freshman self to do one thing, it would be to figure out how to manage your time! It is definitely possible to stay on top of your classes and still have time for a social life in college. And another thing, don't forget about taking care of yourself! That includes physical and mental health. Find an outlet to de-stress and relax after a long day or week. I knew at this point in my college career I had made enough mistakes that I've learned from to give advice to incoming students, who aren't too sure about what they should and shouldn't do. The best part about college is you get to meet new people, hear their stories and experience new things, and I just wanted to help my mentees realize that. I became a Peer Mentor in order to help incoming students transition into college by sharing my experiences with them. My main goal is to help the students strive both academically and socially while enjoying their college experience. In the end, I hope to impact as many students as possible and say that I was able to shape their college experiences! There are many things that I do to de-stress including playing ultimate Frisbee with my friends, working out, and watching YouTube videos. All of these are great ways to de-stress, but my absolute favorite way to de-stress is by napping. Napping is a great way to shut out all the anxiety that you have and gives your mind a fresh reboot. I would tell my freshman self to be more aware of my physical health. The Freshman 15 is definitely real but can easily be prevented by doing moderate exercise and watching the kind of food that you're eating. Especially if you live on campus, since you have access to an unlimited amount of food 24/7.